Last week was the end of my CSA boxes. The CSA was definitely a fun challenge this summer! I’ve enjoyed the challenge of cooking with a variety of surprise vegetables! The last box included a small eggplant and I still had an eggplant from the week before, so it was quite fortunate when I stumbled upon this recipe. 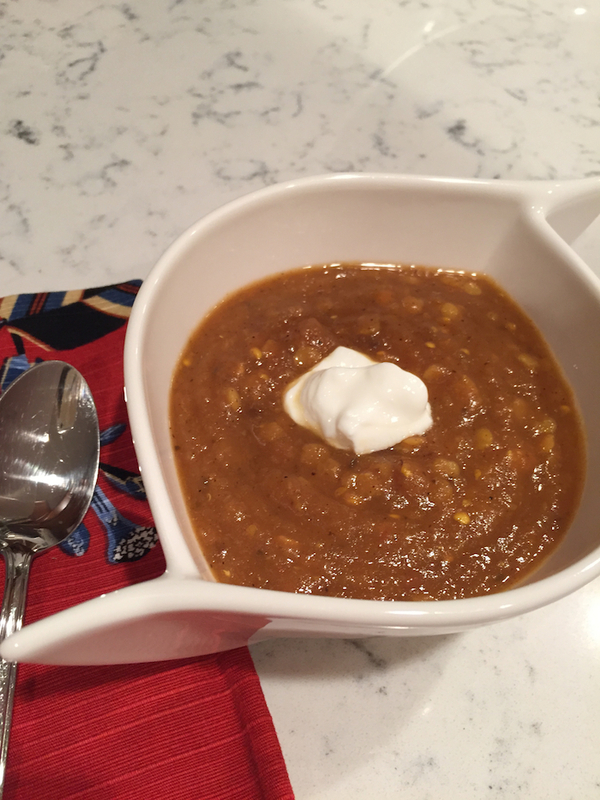 This is a fantastic fall vegetarian soup. The eggplant is pureed to create a creamy, decadent texture that’s complemented by the chewy red lentils. This has a bit of heat which I mellowed out with a dollop of plain Greek yogurt (in place of sour cream). However, if spicy isn’t your jam you can leave out the pepper. In a large stewpot, heat olive oil over medium heat, and add the onions. Sautee the onions until they’re just beginning to soften, then add the ginger, curry powder, cumin, cayenne pepper, and serrano pepper, and sautee for a few minutes. Add eggplant, honey and soy sauce, and season well with salt. Add tomatoes, coconut milk, and 2 cups of the vegetable broth, bring to a boil and then reduce to a simmer for about 20 minutes, or until eggplant is soft. Using an immersion blender, or transferring to a blender, puree the soup until smooth (or at your desired consistency). Add the lentils and the remaining two cups of broth and simmer for about 20 minutes, or until lentils are tender. Stir in the lime juice. Taste and season as needed. Serve and top with plain Greek yogurt.